Disability History is taking off in Western Europe, as evidenced by the Public Disability History Blog started in January 2016 that has already surpassed 10,000 visitors. In the guest blog shared below, Catherine Kudlick joins the conversation by introducing the “Patient No More” exhibit. 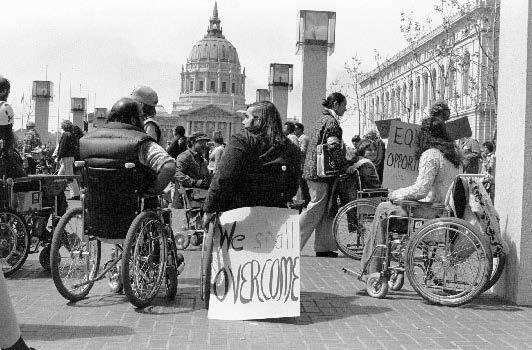 First, the story itself: on April 5, 1977, more than 100 Americans with and without disabilities began a twenty-six day occupation of San Francisco’s Federal Building to insist on getting civil rights. Four years earlier, Section 504 of the Rehabilitation Act of 1973 made it illegal for any facilities or programs funded by the national government to discriminate against disabled people. One official’s signature stood in the way of the law taking effect. After four years of waiting, a coalition made up people with different disabilities launched protests across the country. San Francisco’s occupation proved the most involved and successful. In fact, thanks to support from local community groups like the Black Panther Party, Glide Memorial Church, the Gay Men’s Butterfly Brigade, as well as local and national politicians, it remains the longest unarmed take-over of a federal building in US history. The occupation itself and subsequent victory gave birth to a national disability rights movement and helped pave the way for passing Americans with Disabilities Act (ADA) thirteen years later in 1990.